Jonathan Newell looks at new connector designs that overcome the difficult conditions in wind turbine towers. As the energy generation industry changes its approach from consuming natural resources to a more sustainable model, so the landscape is also changing with the appearance of more solar farms, hydro-electric power stations and collections of wind turbines. The growth of wind energy has been gaining momentum since the first turbines appeared in the 1980s with countries like Germany taking a stance of promoting more sustainable sources of energy and focusing on wind generation as an alternative to building more nuclear power plants. By 2016, Germany had installed over 27,000 wind turbines generating approximately 46,000 MW of output and that figure is still growing strongly, both in Germany and other parts of the world. According to Jens Grunwald, Assistant to the Board of Directors at Harting Germany responsible for new technology and system integration, the demands on all turbine components are extremely high with a wide range of different devices and subsystems being incorporated within the turbine for power supply, data communication and transmission of control signals. “Powerful connectors have an important part to play in this respect, helping to control the gondola, the position related to the wind, changes to the rotor blades, blade heating and beacons, for example,” explains Grunwald. The Harting Technology Group has a significant stake in the wind energy businesss resulting from its innovative technical expertise, which it has used in the development of a wide range of connectivity products and systems. As a result, the group has acted as a technology partner to the world’s major wind turbine manufacturers for over 30 years, yielding a huge amount of experience in the wind energy industry. The challenges for component technology in wind turbines are significant. Large temperature fluctuations, changing wind conditions and the variations across installation sites in countries and regions with widely differing infrastructures and climates make extraordinary demands on materials, reliability and service. Although the majority of German wind farm installations are onshore, the location and environmental factors of offshore projects present even further difficulties. Waterproof connectors and non-corroding housings that are resistant to the increased salt content of sea water and sea air require a correspondingly high level of protection in terms of installed components. Variations in the rated output of the turbines are less of an issue as the same standards of quality, durability, reliability and resistance to environmental factors are the same, regardless of whether the application is for small wind turbines in hilly low wind locations with a rated output of around 45 kW and a rotor diameter of just a few metres or for a large wind turbine with a hub height of 140m and a rated output of 4,000 kW. To overcome these harsh environmental factors, Harting developed the Han-Eco module, a tough connector system for electrical and electronic connectivity that defies the elements and provides reliable connectivity in such use cases are wind energy generation. With a high protection rating of IP65 and an operating temperature range of between -40C and +125C, the connector is also very flexible in terms of installation – an important factor in the often cramped environment of a turbine nacelle. The high performance plastics from which it is made provide a high level of resistance to aggressive environmental elements including salt spray and high moisture content. The plastic is also very robust and light. Its weight satisfies the trend in both onshore and offshore power generation for reducing turbine weight in order to facilitate higher towers and greater diameter rotors with longer blades. Such connectors as the Han-Eco have a number of possible applications within wind turbines including power connection, communications connectivity and even facilities wiring such as the lighting controls for staff and maintenance teams. In this respect, Harting is currently working with the wind energy industry to develop both specific and tailored services, including individual components as well as complete turnkey systems such as cable assemblies and harnesses. These can be manufactured to order or built on location to suit individual requirements. In one example, Harting has been working with wind turbine manufacturer Enercon to build a connector with a black powder coating for installation in offshore turbines. 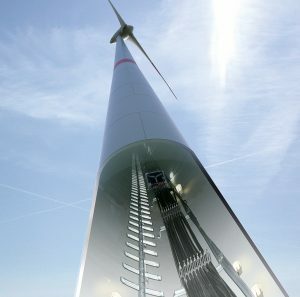 The two companies have worked together successfully on joint projects such as the provision of connectors for higher currents from 100 to 300A and a housing concept for a new LED lighting system inside wind turbine towers. To provide all-important lighting for the tower, Harting developed a long-life LED bulb with an expected life of greater than 100,000 hours as well as a supporting lighting system with built-in redundancy to mitigate any failures that may occur. The fully cooled system is based on two independent electric circuits, each of which has a signal transmitter built into it to sound an alert within the tower if there is a failure. With such a failure, the system alternates from one circuit to the other to ensure continuity of lighting in all eventualities. This modular, redundant approach is also backed up by an uninterruptable power supply located in the base of the tower. The LED lighting system that Harting supplies can extend to other aspects of turbine illumination including the turbine itself. Harting supplies this as an integral system with pluggable device connection, cable assembly, distribution units and UPS. Individual analysis determines the position of LED bulbs on the turbine to keep them to a minimum and reduce energy costs. Harting’s expertise is also being applied to remote condition monitoring of wind energy turbines, using the company’s MICA (Modular Industry Computing Architecture) product, a compact, lightweight and powerful industrial computing platform, which is suited to being programmed for data acquisition, analysis and distribution of parametric data for condition monitoring and maintenance planning purposes. According to Grunwald, the MICA platform makes it possible to connect existing turbines quickly and cost effectively, adapting them for condition monitoring and predictive maintenance. The platform is being installed in many new-build turbines but can also be retrofitted to existing installations in the field. 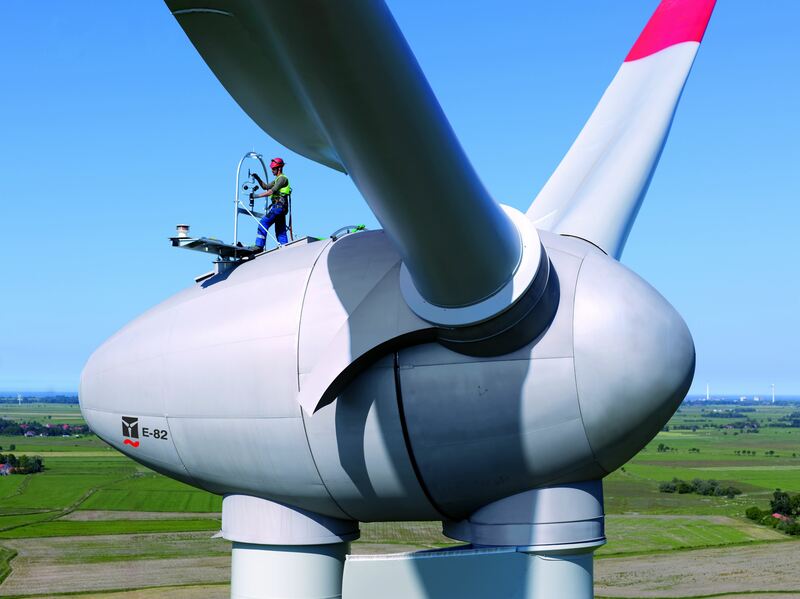 With the right edge sensors for capturing the data, such parameters as the temperature of rotating axles can be captured and processed in a de-centralised way, all the data being gathered and processed on the MICA, servicing a single installation or a group of turbines. The MICA can be configured to raise alerts against different policies, such as a drift in values or the passing of a triggering threshold. By using such a connected Internet-of-Things approach to condition monitoring, maintenance visits can be reduced and reliability increased, important factors as the number of wind turbine installations continues to increase.